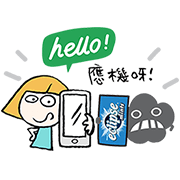 http://www.line-stickers.com/ – Rikumaruʹs Job Hunting with Rikunabi Line Sticker | Rikunabiʹs official character Rikumaru is here looking for a job in this new sticker set! Cʹmon and get employed with Rikumaru! Available till May 21, 2015.